We wish you all a very happy, and very successful new year. For your trust, for your support, for being yourself, really, we thank you. 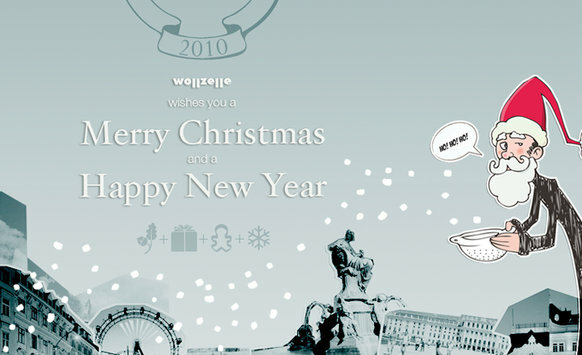 May 2011 bring you all the felicity and success you expect from it. Special thanks go out to those who were able to attend our open office, and join us in this afternoon of celebration. Please note that our offices will be closed between December 23 and January 10, as we take a few days off with friends and family. We will keep a light on, however to ensure our servers and machines are all up and running smoothly. 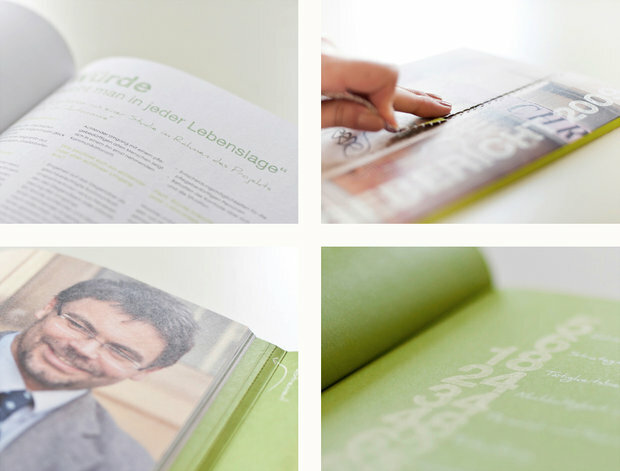 In September 2009, we had the honour of working with the world-renowned St. Gilgen International School to craft a radically new and fresh approach to academic branding, that would reflect the school’s unique stance on quality education. 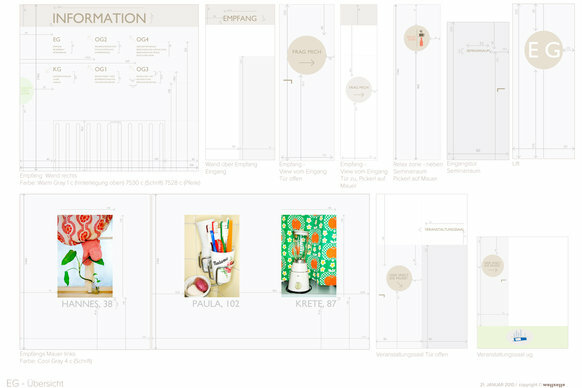 The resulting brochure retains the visual language we introduced with the site, starting with the strong, unabashedly traditional crest, and the constant layering of frames and perspectives. By putting images in close spacial relationship, we enhance both their kinship and their dissonance, thereby inviting the reader to imagine the stories and events that make them go together. Nothing, not even a multimedia website, replaces the vivid colours of the mind and we made sure the imagery both represented and suggested the reality of the school: there are no clip-arts or bromides to be found there! While the medium may not be all the message, it certainly accounts for a lot of it. Therefore, the school’s core values of excellence and self actualisation are evidenced in the materials used for the brochure. 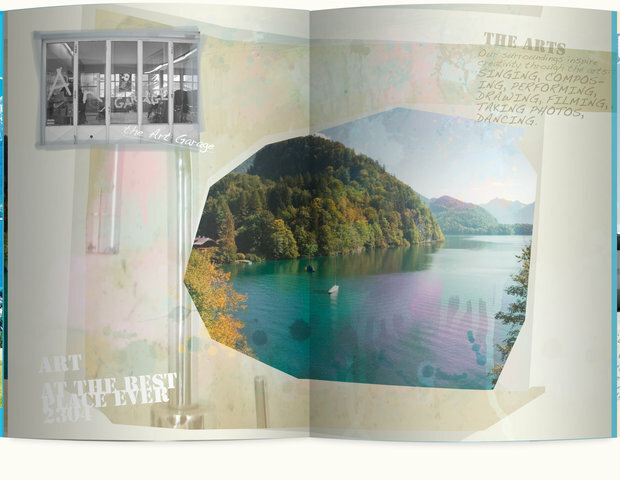 Thick, tactile paper and highly saturated inks help the photos, drawings and type spring to life in ways that a vertical screen could never afford. This brochure is like the values it promotes: modern but deeply rooted in tradition and, most of all, here to stay! 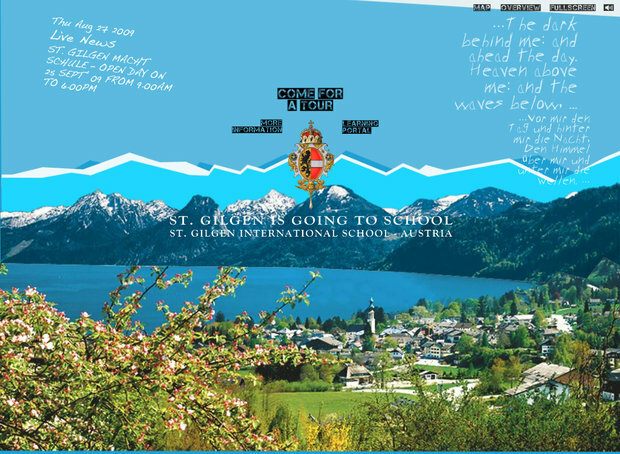 We are delighted to see the new St. Gilgen aesthetic, which wollzelle originally devised as a primarily online language, progressively evolve into the school’s trade dress, the sure sign of a solid and flourishing brand that has found its one true voice. 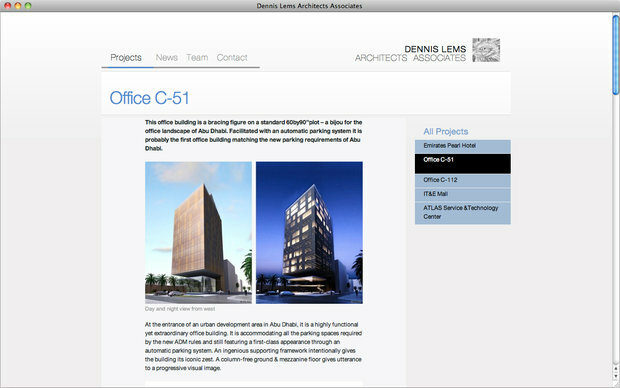 Liked the project? 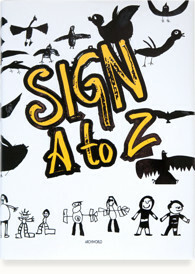 Now get the book! 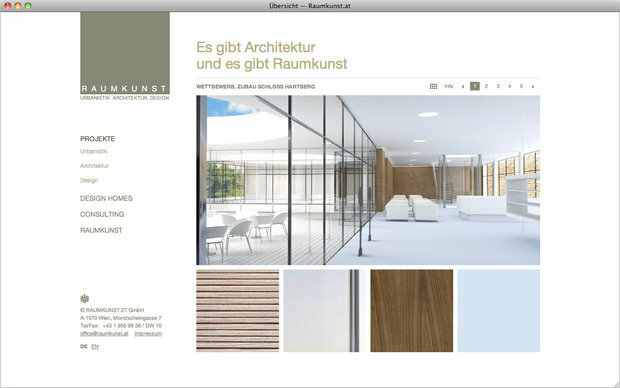 The book, which came out only last week, has been released by the Archiworld Co.. It focuses on signage systems from all around the world, and presents them in a way that is both accurate and fun to dive into, which makes it the perfect gift for your favourite designer or type nerd this season. 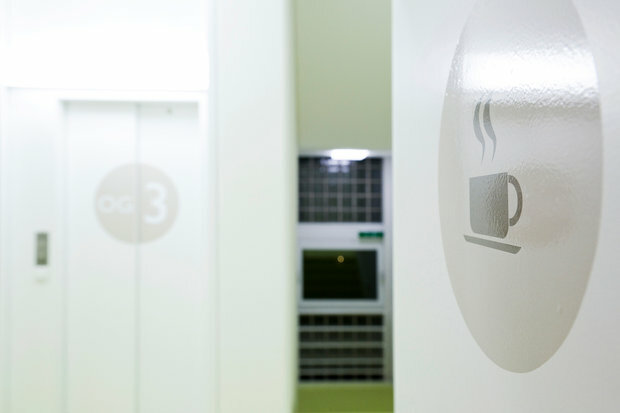 As you may remember from our last post, we accompanied the WHS in their recent move, and helped them design an original signage system, focusing on making their vast and impressive office fun and intuitive to navigate, for both staff and visitors. 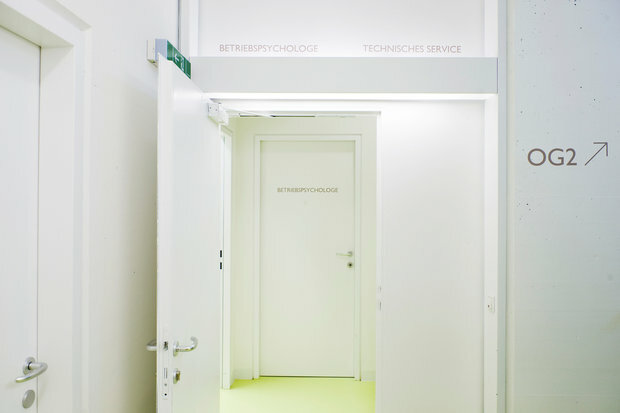 This project entailed a mix of typography, design and interior architecture with a dash of psychology, building upon our various specialties and interests here at wollzelle. We are therefore all the more delighted it clicked and are looking forwards to discovering the dozen more that are presented in the book! Our thanks to the WHS for their support, as always, and to the fine folks at Archiworld for thinking of us. 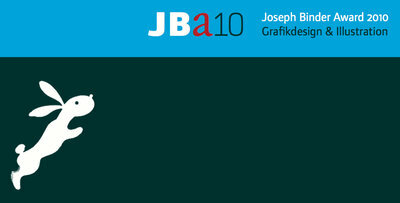 Organised yearly since 1996 by Design Austria, our local equivalent to AIGA, the Joseph Binder Awards commemorate this influential figure of the XXth century by recognising fresh inroads in the field. Its international jury is comprised of well-known creatives and leaders of the industry, and the award covers the crème de la crème of graphic design, meaning illustration, information design and typography to the exclusion of multimedia and other less clearly defined works. Today, we are delighted to announce we were selected amongst the 63 shortlisted projects, out of 447 entries submitted by this year’s 206 participants from all over the world — the United States, India, Croatia and beyond in addition to neighbouring countries such as Germany and Switzerland. 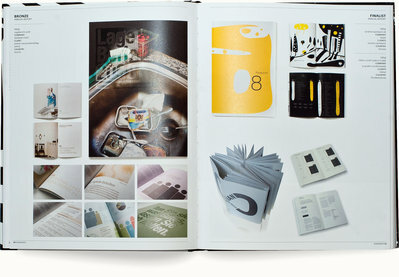 This means wollzelle is featured in the 2010 edition of the Awards book, a gorgeous booklet that condenses the best in design over the past two years. 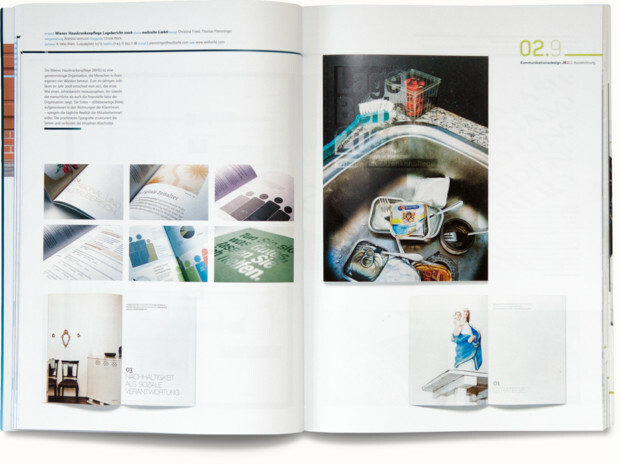 Our winning project was the WHS Lagebericht 2008, an unusual publication combining the traditional fixings of an annual report with original photography and engaging copy whose release marked the first of many award-winning projects for our esteemed client. 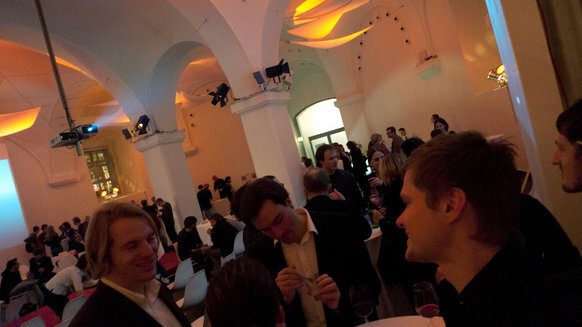 The ceremony was held in Vienna’s Museumsquartier, and a great time was had by all, networking and discovering the work of our peers. Our thanks go out to Design Austria and the Awards jury for thinking of us and and deeming our work worthy of such recognition. As always, our most heartfelt gratitude to the great team at the WHS for affording us such freedom in preparing their projects. The American Design Awards are a young and independent competition. Founded in 2000, their aim is to reward projects and companies with a strong sense of ethics and a clearly defined commitment to the creative community. 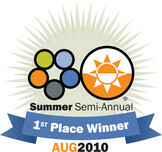 Today, we are delighted to announce we won the first prize in the “Annual Report Design” category of the 2010 Summer Semi-Annual contest. We are especially proud of this one, considering there were 1 640 applicants in this particular edition and only 55 winners across all categories! Of course, the real winners are the product and the clients who commissioned it. 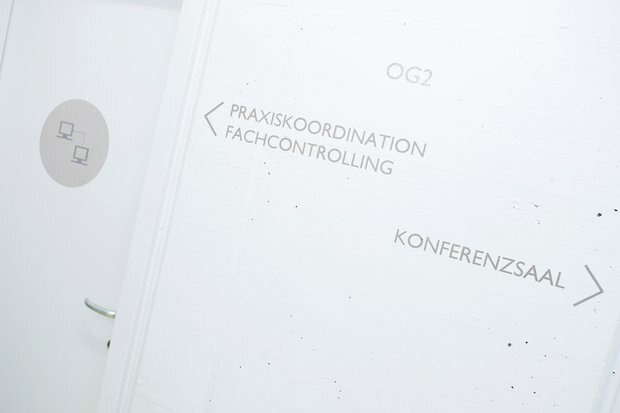 In this particular instance, it is our long-term partner, the Wiener Hauskrankenpflege who can add this accomplishment to their long list of awards! 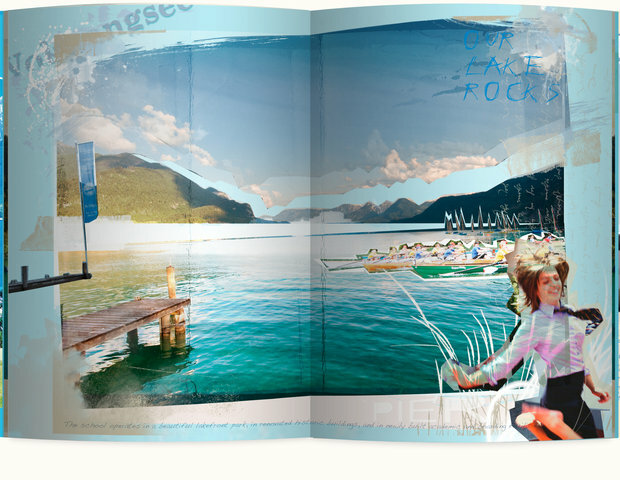 The winning project was our WHS Lagebericht 2009, an annual report with a twist, presenting the WHS inside and out from both a financial and social standpoint. Blending original type, off-beat photography and engaging copy, it aimed to put a fresh twist on the dry and serious business of annual reports, without sacrificing legibility or, for that matter, usability — for these are essential legal documents after all. 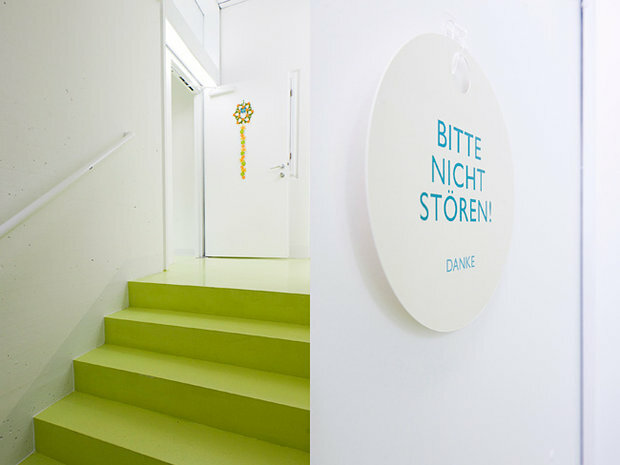 The Wiener Hauskrankenpflege and wollzelle share a rich history of breakthroughs and creativity. From paper to collaterals all the way through signage, it has been our pleasure and honour to push the boundaries of corporate communication. Over the years, we have had the honour of receiving accolades from our peers in the industry, and the pleasure to thus spread our client’s message further. 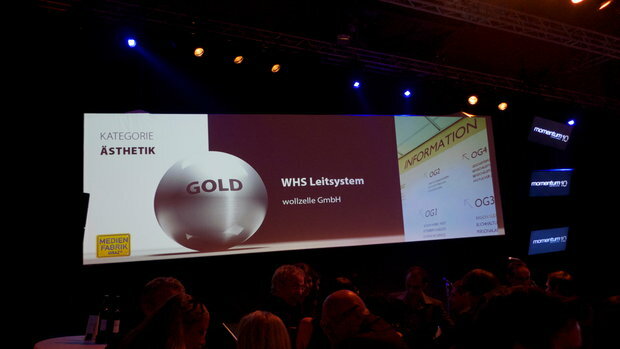 Continuing this long tradition, we are thrilled to announce we won a Gold award at Momentum 10 last week, for the aforementioned WHS Leitsystem, an innovative signage system we implemented at the WHS’s new headquarters, to guide visitors efficiently through a vast building, all the while keeping pressure and administrative jargon to a strict minimum. 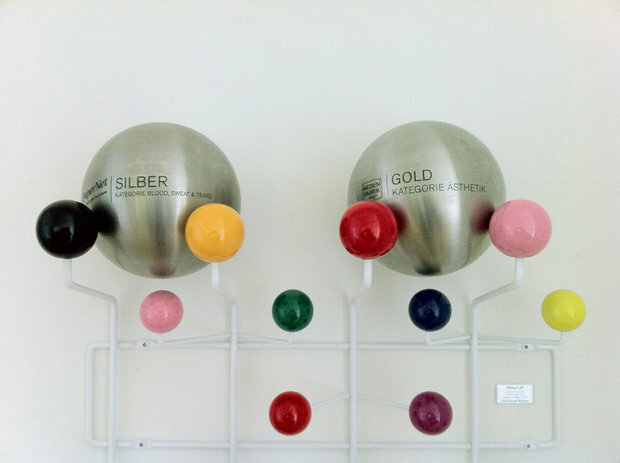 Needless to say, we are thrilled to receive our second Momentum award in two years, and in the very coveted “Aesthetics” category to boot. Competition was steep, and we do wish to grab the occasion to tip our hats to the other contestants. To wrap up, we would like to thank our friends and partners at the WHS, without whom this project would not exist. We appreciate their continued support and their trust in letting us develop wild concepts for them. It means the world to us! 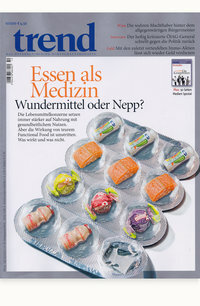 The Wiener Hauskrankenpflege’s 2009 Annual Report is causing quite a stir nationally! 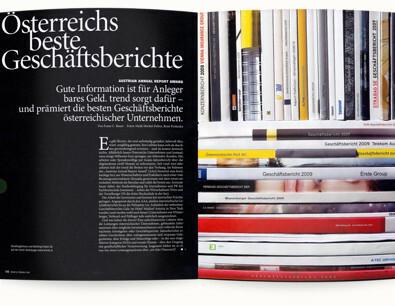 It has recently been awarded the first place in the NGOs category of the Austrian Annual Reports Awards (AAA). 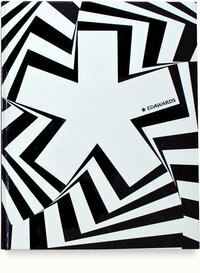 Run by Trend magazine for 22 years, the AAAs recognise annual reports that excel in both style and substance. Their jury is composed of independent businesspeople, and its grading system has been recognised for its clarity and transparency. 2009 was a key year for the WHS. 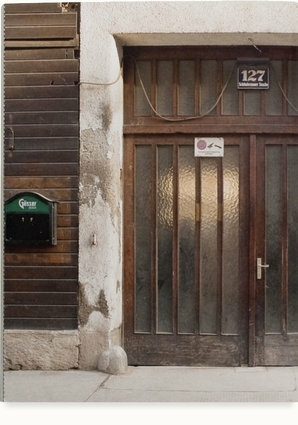 It was a year of change and transformation for this worthy, time-trusted Viennese institution. 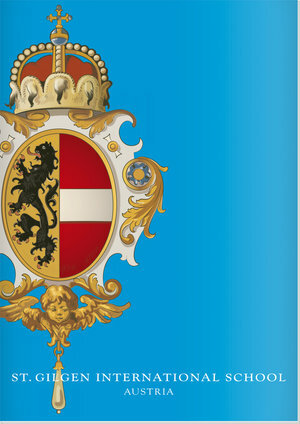 Therefore, we are doubly happy that their message is being broadcast to the magazine’s 300 000 regular readers across Austria, thereby increasing the recognition of their brand, message and values. Featuring original photography, hand-drawn graphs and refined type, this report encapsulates all that the WHS stands for: relatable, straightforward, human. With its new identity, new offices and now increased national recognition of their accomplishments, the WHS is successfully answering the challenges of the XXI^st^ century, and we could not be happier. We at wollzelle would like to thank the WHS for their trust over the years. Also, a tip of the hat to our partners in crime who helped the report see the light of day: Bösmüller, who turned our digital files into beautiful print, Wolfgang Kühnelt, who helped shaping the copy for the report, and Franco Winter who brought to life the many portraits that enliven and shape the report. It seems we reported on the WHS annual report for 2008 only yesterday. Since then, a lot has happened for this upstanding institution, and long time client of wollzelle, including the massive consolidation of four separate offices into a building of their own — designed afresh, no less. Because changing buildings is also about changing perspectives, and finding enriching new ways to work together, we made the move, and the people behind it, the star of this year’s show. 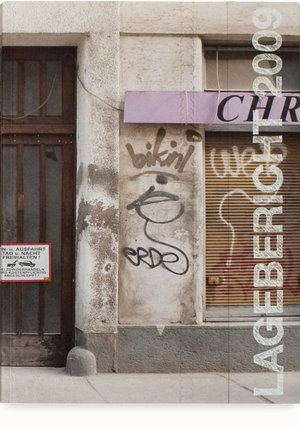 One of the most striking elements of the “Lagebericht 2009,” as it is known to the locals, is the cover, which also acts as its packaging. Reading the document entails tearing away a strip of paper, as if to open a box, thereby physically introducing the reader to the report’s salient themes: movement, discoveries, collaboration. While the outside features an image of the previous WHS headquarter, the inside offers an exploration of the institution’s new surroundings, immediately rewarding interaction and engaging the eye. 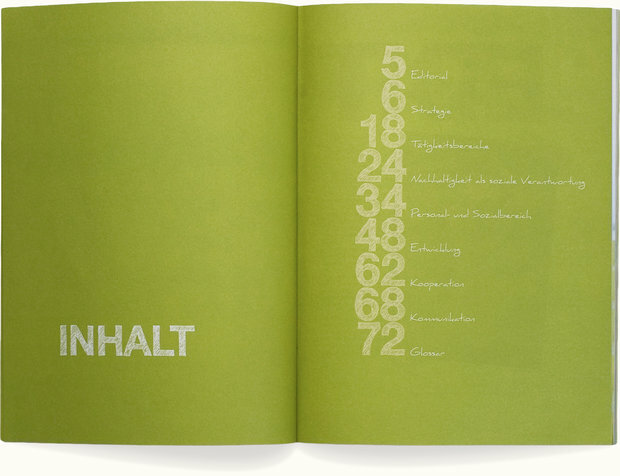 While the predominantly green colour palette obeys the WHS’ branding guidelines and immediately dispels any uncomfortable — and inaccurate — associations with retirement homes, hospitals and illness, the daring typography breaks the report’s clear structure into legible and attractive chunks. The clean sans-serif-based layout is peppered throughout with hand-written titles, pencilled graphs and flat saturated colours to convey a sense of perspective and energy, without sacrificing mathematical precision where it is needed. Our collaboration with Franco Winter, brought to life the many portraits that enliven and shape the report, in stark contrast with last year’s urban still lives. After celebrating some of the organisation’s most iconic and representative clients, we have opted to focus on its administrators and caregivers without whom none of this machinery could be set in motion. Staff are depicted in their everyday setting, performing the very relatable tasks of carrying papers, enjoying a cup of tea or peeking at the sunny views outside the window, carrying on the document’s overall message. It should be noted that, continuing our tradition, all these snapshots are genuine, proving once again that authenticity never goes out of style. We hope you enjoy reading this report as much as we enjoyed crafting it. You can download the WHS Lagebericht 2009 in PDF format. As always, we tip our hats to the WHS and its associates, for their efforts and accomplishments, and welcome your comments. We’re going to hire a freelancer on a contract basis who works either from our offices or remote. If you think you are the one, please send a minimum of 3 examples of your work to jobs[at]wollzelle[dot]com. Last Sunday the best of graphic design, illustration and multimedia design in Europe were honoured at the European Design Awards Ceremony in Rotterdam, The Netherlands. 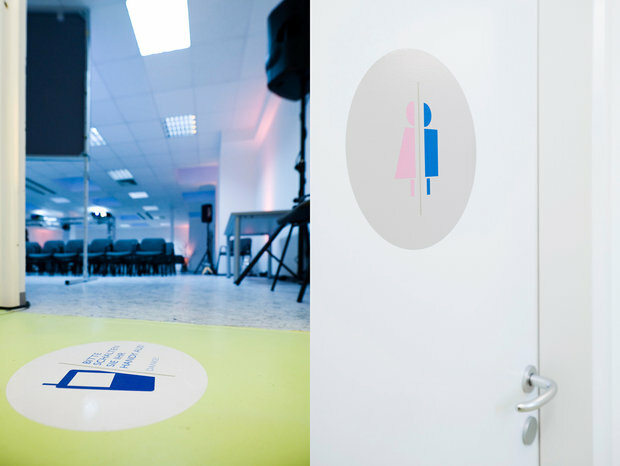 This ceremony is the crowning event of the ED-Festival, a 3-day conference organised around lectures given by speakers and graphic design celebrities from all over Europe. The festival travels every year to a new city in Europe. 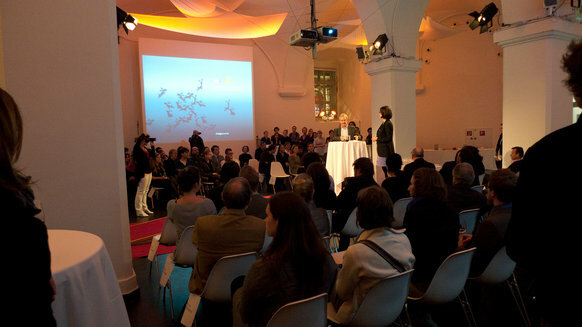 After Athens, Stockholm, and Zurich, Rotterdam hosted the festival from 28 to 30 May 2010. Images from the Award Ceremony. 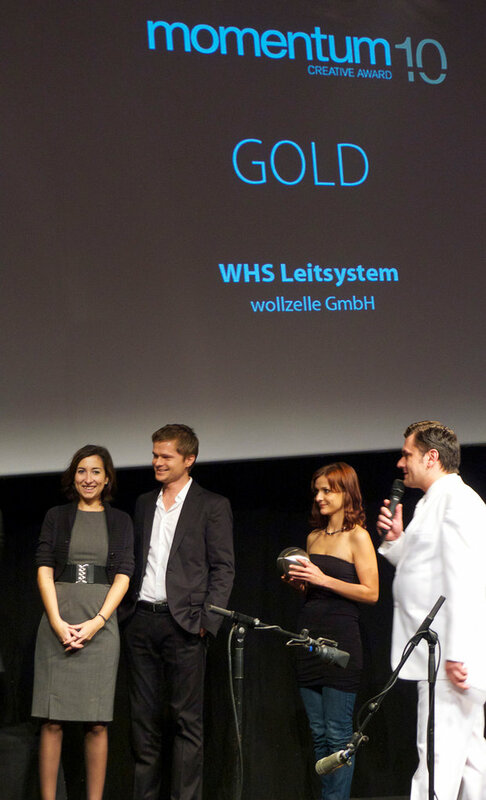 We are pleased to announce that we received a bronze trophy in the category Publications/Annual Report for the WHS Lagebericht 2008 and the website for the St. Gilgen International School made it to the list of finalists. The European Design Awards is the comprehensive annual awards organization acknowledging the best of graphic design, illustration and multimedia design in Europe. 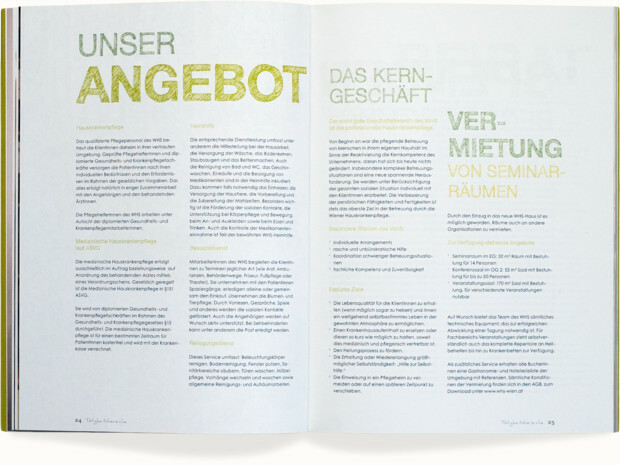 It is based on a collaboration of 14 prestigious communication design magazines in Europe who have taken upon them to support and promote the event. 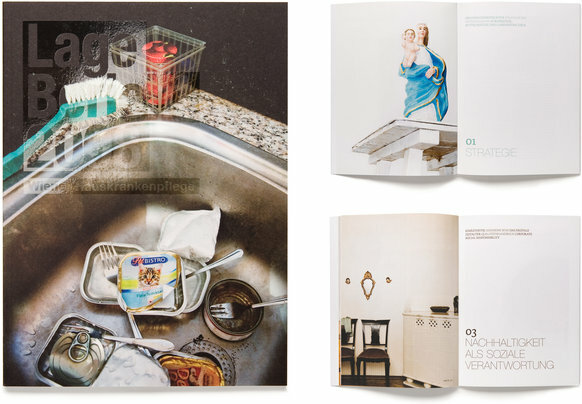 Representatives of these magazines compose the jury: 2+3D (PL), Design Austria (AT), Design Week (UK), +design (GR), Elephant (Int), étapes: (FR), Grafik Tasarim (TR), idpure (CH), KAK (RU), Novum (DE), Progetto Grafico (IT), TYPO (CZ), Visual(ES), BNO Vormberichten (NL). Architects and designers share a common set of goals: providing novel and memorable solutions to life’s everyday problems. Whether their work is about creating spaces or what goes into them, their craft lies at the intersection of art and technology. 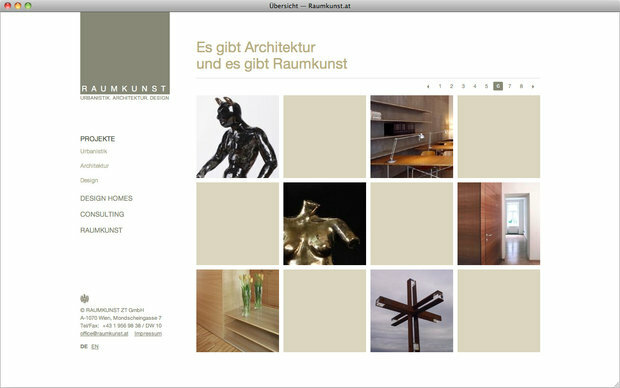 In this light, we are doubly happy to finally share two sites we designed for architecture firms: Raumkunst and Dennis Lems were we also featured the process a while ago. 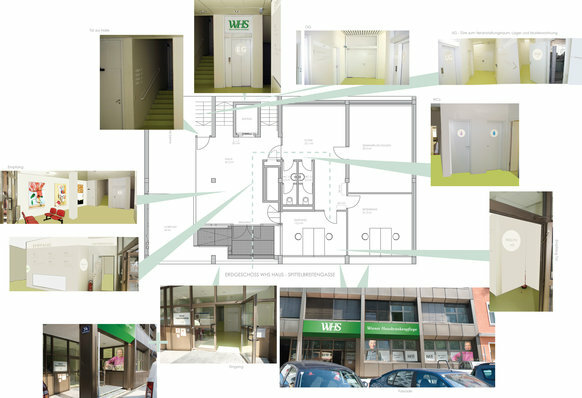 Considering our own architectural background (Christina and I both studied architecture) we always appreciate the challenge of transposing an architect’s logic and his emotional palette into the virtual world, from brick and mortar to zeros and ones. 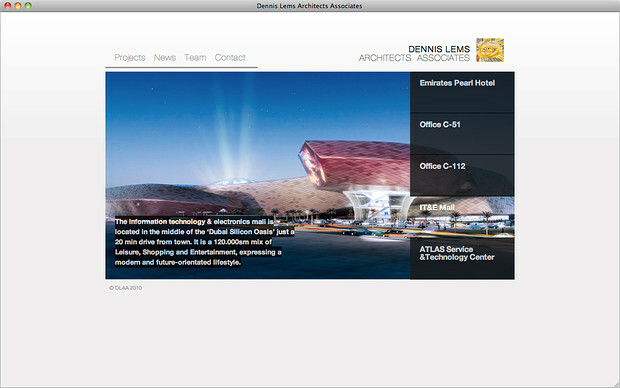 Because buildings are statements, and part of an architect’s brand, we decided to feature them front and centre. Even though both sites speak wholly different visual languages, they are united by the lavish use of photography, from magnified details that emphasise craft to wide shots that highlight proportions. Both sites feature a strong, directive site structure and guide the visitor through a clearly defined tour of services, past accomplishments and portraits. 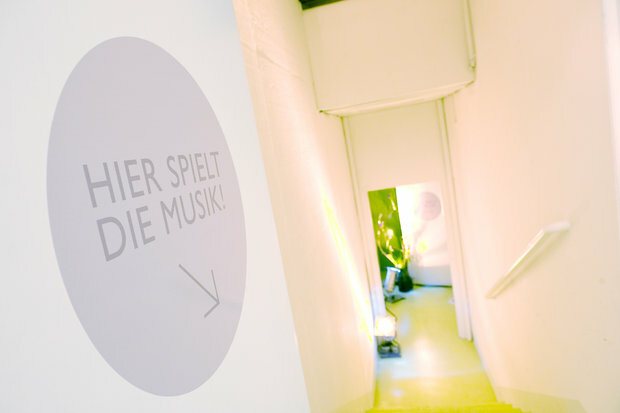 Each section, in effect, creates a space to be interacted with. Both domains are built upon our custom mix of standards-based technologies, as well as our trusty image processing back-ends, fluxiom and ImageGeisha, to allow for quick and painless updates as projects come and go. We look forwards to seeing you at the house warming party! We are looking for a senior web developer to join our team. 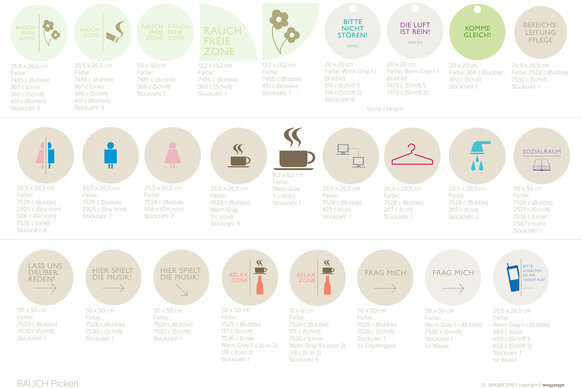 At wollzelle you will be working across multiple clients and projects, as part of a team of designers and developers. You are passionate about designing websites, interfaces and web applications, and you have the relevant skills to bring your ideas to life. We’re think of hiring a freelancer who works either from our offices or remote, so location doesn’t matter that much in this case. If you think you are the one, please send your CV, portfolio/links/code examples showing your work (minimum of 3) to jobs[at]wollzelle[dot]com before March 26, 2010. We are currently reviewing the applications within this week and we will answer everyone within the next two weeks. Thanks for your patience. If you are late to the game we will accept submission until April 2, 2010. 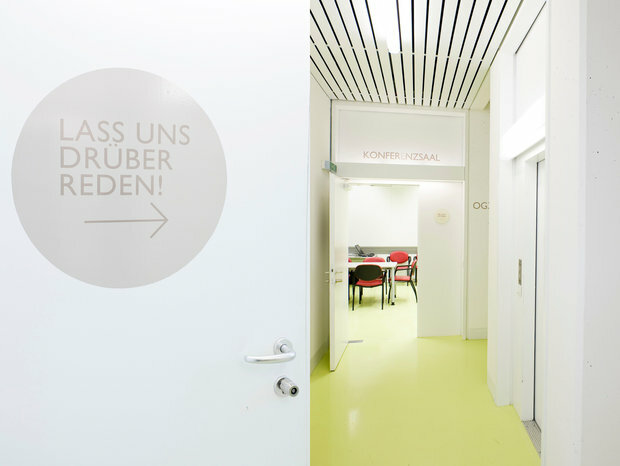 The Wiener Hauskrankenpflege have recently merged their four separate offices into a newly refurbished five story building in Vienna’s twelfth district. 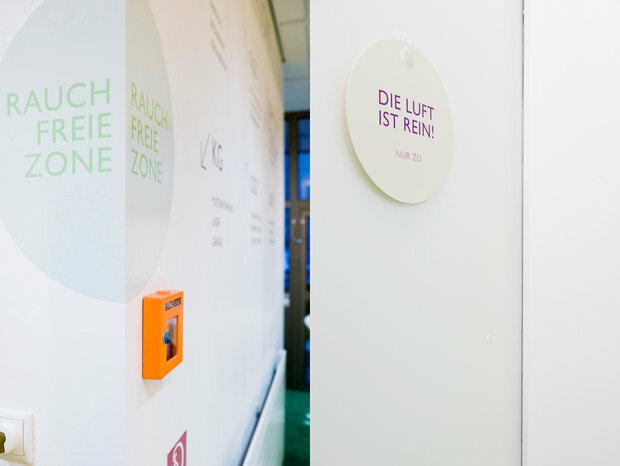 We are honoured to report they turned to wollzelle to design an original wayfinding system that would match their brand, echo their personality and, of course, get staff and visitors to their destination as painlessly as possible. To reflect the brand’s caring, relatable personality, we opted for warm hues and a geometric, open typeface. Furthermore, we forewent signage pomposity in favour of a straightforward, idiomatic style that draws its inspiration from regional sayings and mannerisms, raising the occasional chuckle and making an official building feel that much more like a home. 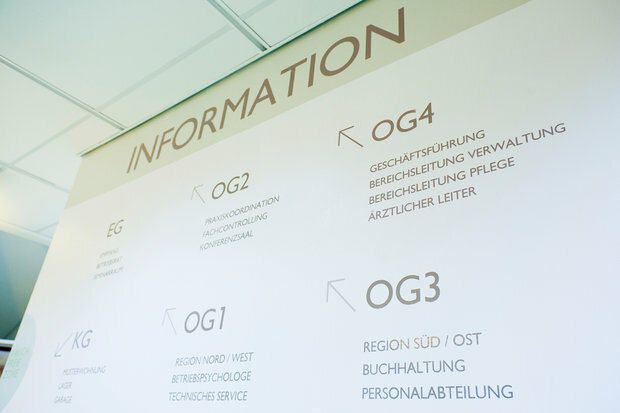 Its logical colour palette and straightforward family of pictograms can be easily extended as the organisation adds new services, moves existing ones, or even adds an entirely new wing to the building. 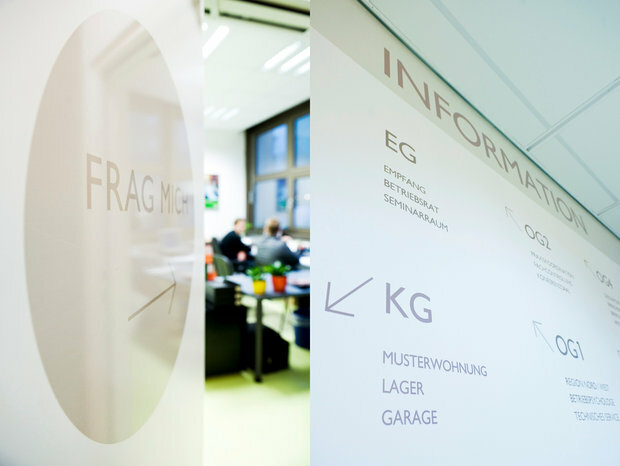 Below are some images of the signage system in action. More shots can be seen on our flickr photostream.